A TEENAGER has been found guilty of killing a youth worker who confronted a group of drug dealers outside his home. Omid Saidy was knifed in the neck after he chased two teenagers from outside his house near Parsons Green, south-west London, the Old Bailey heard. The 20-year-old had gone after the suspected dealers with his friend Oluwafemi Omotosho, known as Femi, who came off his moped and was stabbed in the chest as he lay on the ground. Shafiq Smith, 19, and a 17-year-old, who cannot be named because of his age, were on trial accused of Mr Saidy's murder. Giving evidence, the youth admitted drug dealing in the area but told jurors Mr Saidy had a knife and he stabbed him in self-defence. A jury acquitted the 17-year-old boy of murder but found him guilty of manslaughter. Smith was cleared over the killing but was convicted of wounding Mr Omotosho with intent. Prosecutor Timothy Cray had told the Old Bailey trial: "Omid was angry that people were dealing drugs near (his) address." He said the group had been asked to move on earlier on October 16 last year but returned that evening with their faces masked or wearing hoods. After an initial chase by Mr Saidy and his father Majid, who had come outside with the family dog to ask the group to go away, the defendants produced knives, the court heard. Majid Saidy told jurors the youths were "taunting" his son with the blades and he tried to tell him to "let it go". But the victim ran after them, saying: "I'm not having this, they can't be waving knives at me like that." 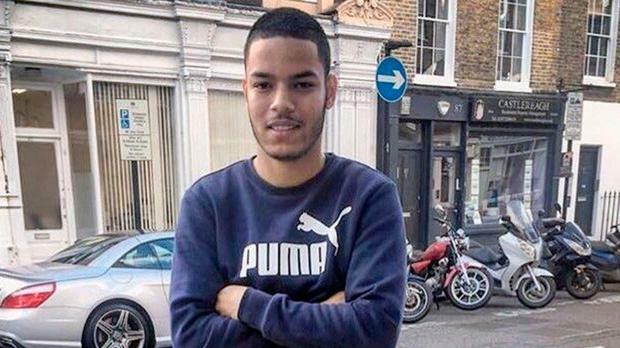 A fight ensued under a railway bridge - not covered by CCTV - on Parsons Green Lane near the Tube station, in which Mr Saidy was killed and his friend was injured. Mr Cray had told jurors: "Should they have chased the defendants? Absolutely not. "Dealing with drug dealers is the work of the police and the events show how quickly violence can spread if individuals try and take the law into their own hands. "But did Omid need to die for the mistakes he made, and did Femi need to be stabbed in the chest when he was lying on the ground?" Smith, of Laitwood Road in Wandsworth, and the 17-year-old, of Shildon in Durham, who were 18 and 16 at the time, denied all the charges against them. They will be sentenced at the Old Bailey on a date to be fixed.